We’ve written about football and traumatic brain injuries before, but as time passes, scientists are obtaining more and more concrete evidence that football is linked to the development of a serious degenerative brain disease, and one that deserves our attention; as well as potentially legal action. Even the National Football League (NFL)—which for years has denied the link between head injuries in football and long-term brain damage—has now conceded that one in three players will develop long-term cognitive problems from the game. 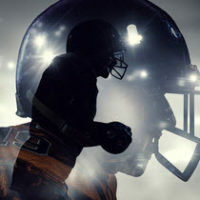 And yet, this estimate sounds overly optimistic: According to the study published in the Journal of American Medical Association earlier this year, more than 99 percent (or 110 out of 111) of brains analyzed by researchers showed evidence of the degenerative brain disease chronic traumatic encephalopathy (CTE). The NFL has arguably known about this problem for years, staying silent while it settled claims: In 2015, in a court-approved one class-action settlement, the NFL agreed to pay up to five million dollars per retired player for medical conditions associated with repeated head trauma. Other, related claims are still pending, although the NFL recently signed a one billion dollar settlement to compensate former players. While confirming CTE has, up until now, required that the player die and donate their brain to research, others have expressed hope that it is possible for an active player to know that they have the condition while they are alive. There are even reports that a particular type of brain scan could reveal the issue while a player is alive: In late November, pathologists were able to confirm that a player had been diagnosed with CTE, while alive, via a positron emission tomography (PET) brain scan. Other recent, relevant studies have indicated that football players tend to experience different degrees of brain damage after concussions, depending upon what type of position they play and how long they play the sport. Specifically, researchers found that former college players who experienced three or more concussions had more white matter damage in their brains than those who had experienced one or no concussions. In addition, non-speed players with a history of recurrent concussions demonstrated the most white matter damage, as well as less brain activity overall during memory exercises. This study also demonstrated that just playing football during college versus continuing to play professionally did not necessarily make things any safer for these players; In other words, playing football for short durations has serious consequences because it’s the higher-speed type of collisions—even if there are just a few of them—that do the most damage. The development of CTE and other brain injuries in NFL players poses a very serious moral question concerning how long we allow people to injure themselves for the sake of sports and entertainment. There is no job that should not only allow, but definitively inflict, life-changing debilitating brain disease on people. If you or a loved one has suffered because of a traumatic brain injury, we can help. We work with experts in and around Florida to build the best possible case. Contact us at Friedland & Associates today for a free consultation.